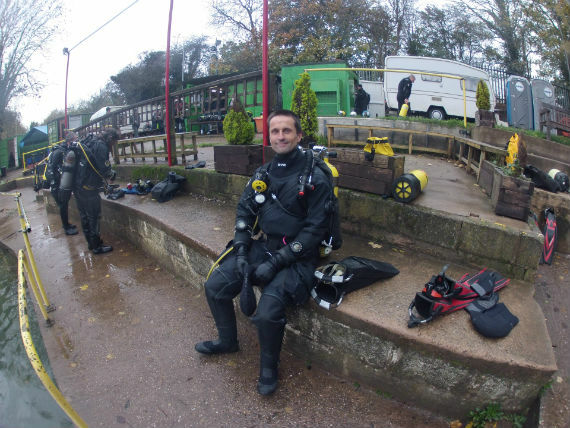 Take a look at the website of Dosthill quarry dive centre and you’ll notice that the owners are not short of superlatives to describe it. 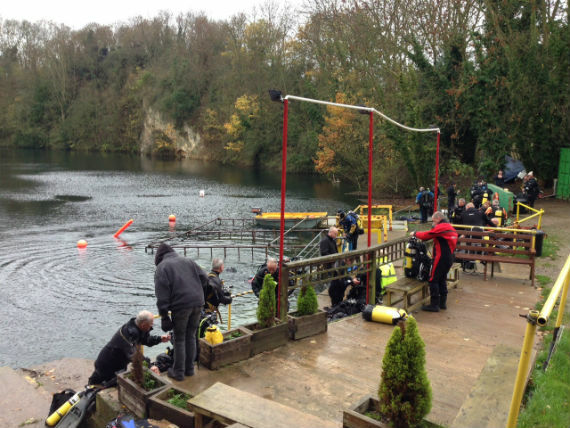 Dosthill, or ‘Dozzi’ as the lake is affectionately known, is billed as the UK’s ‘oldest inland dive site’ and the UK’s ‘prettiest inland dive site’ in the same paragraph. The former is certainly true as Dosthill was the ‘home’ of BSAC from 1958 onwards until it was sold to Ian Forster in the late eighties. ( Ian also owns Gildenburgh water, near Peterborough). Facilities at Dosthill are somewhat basic, it has to be said. The toilets are a pair of portaloos, the office is a shipping container and the greasy fry-up café is a caravan. But who cares, right? This is diving and we shun hummus and cucumber on the weekend. Dosthill is a smaller site than Stoney Cove or Chepstow and it’s not as deep either – about 23 metres at the deepest point. Unusually, the entry point is at the deep end: I can imagine new divers being intimidated by the giant stride entry into a sheer wall drop-off. Helpfully, a series of training platforms have been constructed flush against the quarry wall at 3, 5 and 10 metres, which are held in place by scaffolding. We drop over the side and into the dark. Because at least fifty divers have gone in ahead of us, the sediment had been kicked up and vis rapidly dropped to almost zero. Senses heightened as the four of us switched to diving on instruments. The comforting glow of my super bright Atomic computer showed 22 metres close to my face, but our torchlight struggled to pierce the murk. 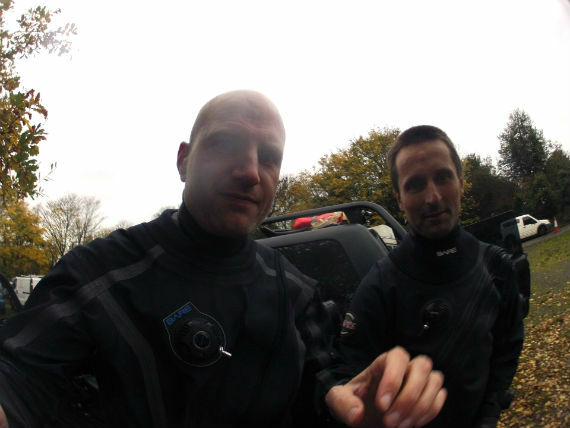 Masochists might enjoy this sort of thing but fingertip diving isn’t much fun for long. 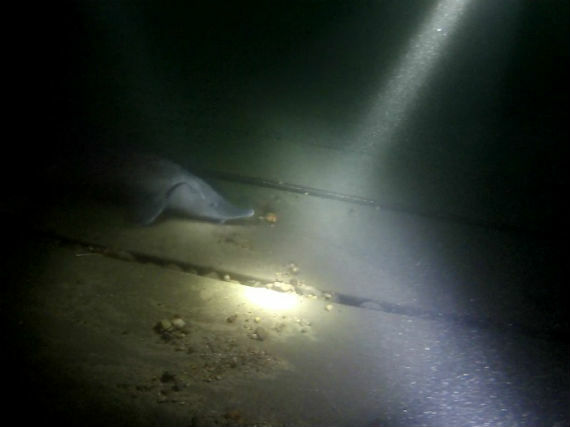 Thankfully we managed to stick together, follow the laid lines and head south successfully – finally breaking out into at least ten metres of vis. Fantastic, and we could see the Cessna jet plane in its final resting place on a 10-metre incline. For our second dive we shun the pit and do a lap instead. 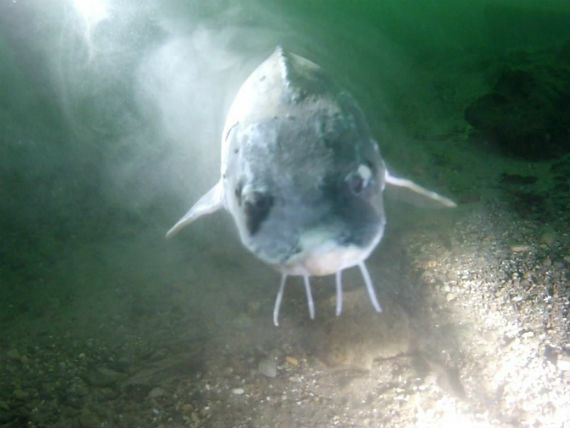 The highlight had to be bumping into the resident sturgeons, both of which were donated to the lake and have thrived: the largest has doubled in size to about four feet long – and still growing. Greg flashes his torch and I see it circling the group, before swimming straight at the camera. 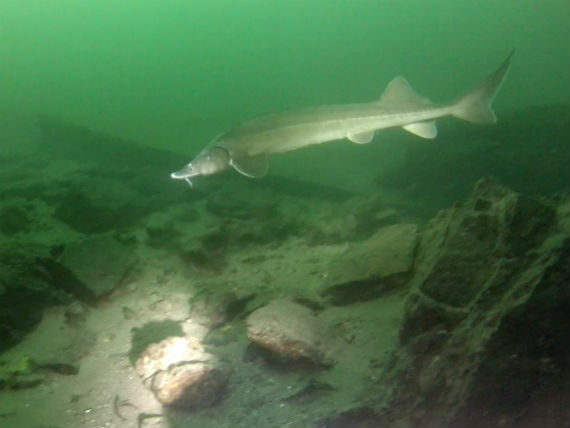 The sturgeon is fantastic to see and so graceful to watch, as befits a distant member of the shark family (as Ian had explained at length earlier). There’s a slightly old-fashioned, no frills feel to Dosthill. 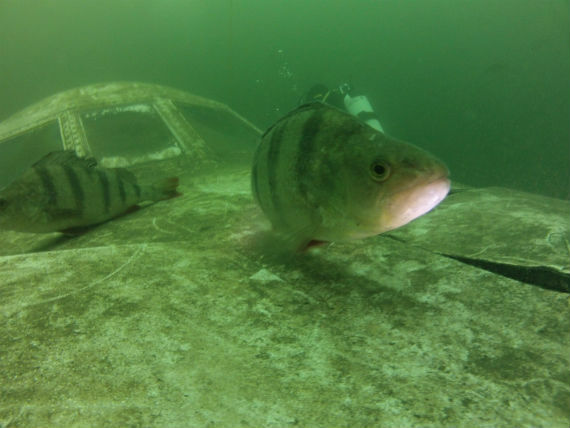 It’s been a commercial dive site since the 1950s and frankly it probably hasn’t changed much since. There are no Suunto computers in lightbox displays, or gourmet cuisine in the on-site restaurant. But the sturgeons are definitely worth hunting down – I’ll certainly be going back.